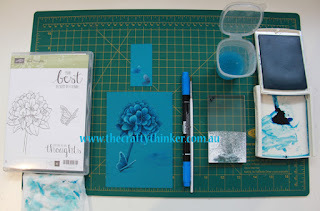 The Crafty Thinker: Stephanie Fischer - Independent Stampin' Up Demonstrator: Best Thoughts - yes.... another Monochrome! Well, my love affair with the monochrome continues! There is something in this card that's making me really kick myself though! Can you spot it? I like to use a Stamp-a-ma-jig to help me position elements in my cards - especially wording (although sometimes I use it just to test if a combination or placement is going to work). I generally use black ink for this (except if I'm using black card stock!) so that it shows clearly. I didn't pay attention and used the black ink on my card instead of the Pacific Point that I had intended! Other things went a bit awry too! I originally had the painted panel mounted on some DSP but didn't like it. So I just trimmed around the panel and layered it into this simple design. The decorative panel now has quite a bit of thickness to it and so it sits quite proud - I quite like that. It was only after I'd taken some photographs that I realised that I had forgotten to add back in the detail of the stamens to the flower. Fortunately, that was easily corrected with a few lines and dots with a Pacific Point marker and white gel pen. I think that's the end of my confession! I gave the butterfly's wings a thorough coat of clear Wink of Stella and then decided to add a touch here and there on the flower. I used Island Indigo cardstock and Pacific Point ink for the decorative panel. 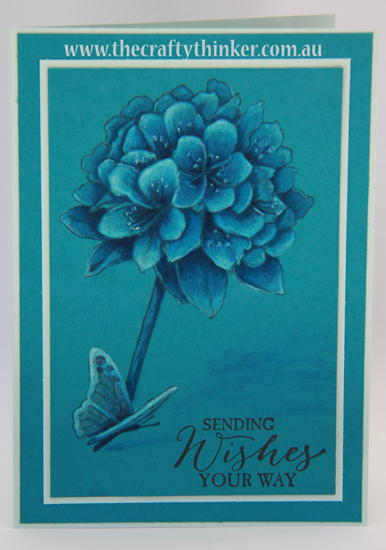 This was layered with Soft Sky and more Island Indigo cardstock. I found the Island Indigo card much more difficult to work with than the Perfect Plum I used in this project. I'm not entirely sure why. One thing that has occurred to me is that the Elegant Eggplant ink is very well pigmented and worked perfectly with the Perfect Plum cardstock to provide the necessary depth of shadow. 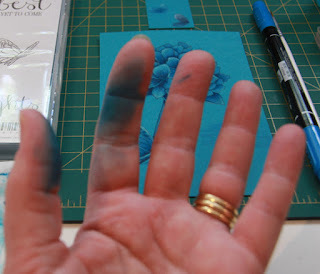 Perhaps I should have tried the Island Indigo ink. I tested out Night of Navy as well as the Pacific Point and preferred the latter. This photo shows my colour tests and gives an idea of how I work. As you can see, I used a fairly fine brush for this card. I knew I wouldn't need a lot of white ink, so I just put some on an acrylic block (as you can see - I still overestimated!). I put a few drops of reinker into the lid of the Pacific Point ink pad and used that as my palette. I can control the depth of colour I apply by taking the ink directly from the pool of ink or from the "swished" ink. 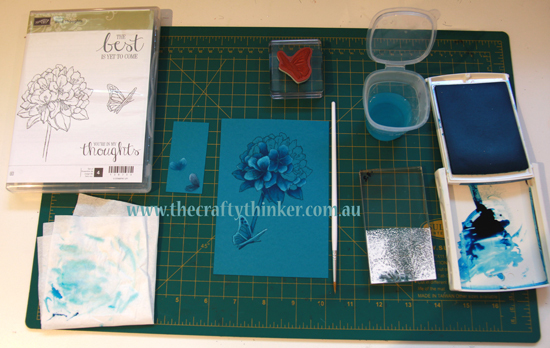 I was careful to use as little water as possible to maintain the integrity of the cardstock (unlike watercolour paper or Shimmery White Cardstock, this cardstock is not created to withstand the stress of water). I had my absorbent paper on hand to remove excess water but ... try as I might to stay clean - I really like to judge how much water is in my brush by feeling it with my fingers. It takes a while to come clean! Meantime, I wear my creative mark with pride! As you can see from the photo above, I added the sentiment at the very end - once I'd decided how to finish the card and trimmed the piece as necessary. You can also see that I added a Pacific Point marker to my tools because it helped me overcome the difficulty I was having getting strong enough darks. I used the pen end of the marker and feathered in strokes of ink where necessary. If necessary, I then blended it out with my brush and a little bit of ink. I hope you like the card and the descriptions may prove useful to you. I'm still awaiting the arrival of the piece I've ordered to connect my phone to a tripod - then I'll try to do a video. I stamped the image on the Island Indigo cardstock using Island Indigo ink. I minimised the water as much as possible - in places I was using a "dry brush" technique. I worked in a scattered way around the piece, allowing areas to dry before working on an adjacent area. I used the marker to add the deepest tones. I tried to keep the strongest contrasts in tone at the front of the flower. The white gel pen that I used for the tips of the stamens (you can tell I'm no botanist!) was a bit too bright, so I dabbed the white dots with the writing end of the Pacific Point marker to tone them down a bit.